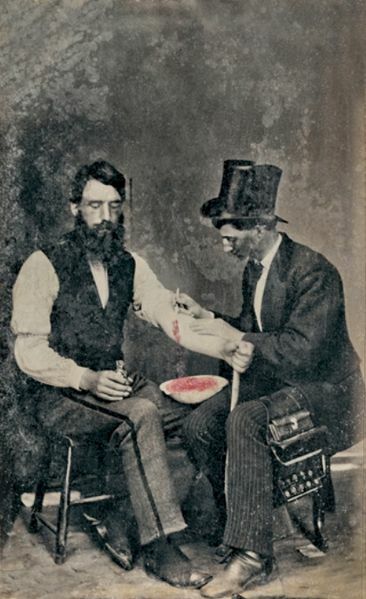 Sickness was a major part of early American life. Many people suffered from poor health their whole lives. But scientifically valid medical knowledge was limited. The world in 1820 was not a much more comfortable place to fall ill than it had been two hundred years earlier. No one knew about germs or the significance of human contact or insects in spreading disease. Medical theory of the time held that sickness resulted from a body out of balance. It was an idea that went back hundreds of years to Roman physician Galen in the 2nd century. To restore balance, mainstream doctors bled, blistered, and sweated patients to large and often painful degrees. They administered large doses of drugs like calomel, a form of mercury, to purge patients. Doctors chose treatments that caused quick and drastic changes in a patient’s condition, which could be interpreted as progress. Though well-intentioned, these mainstream treatments also caused as much, if not more, pain than the sickness itself. As a result, doctors could rarely offer sick Americans a medical means of getting better. And so, phrenologists read character on the topography of people’s skulls, hydropaths attempted to wash out all disease with cold water, and mesmerists transmitted an invisible fluid known as animal magnetism. And millions of Americans became devotees. But why would anyone believe these things could work? Read the rest on The Beacon Broadside.